I don’t follow politics much but the loud condemnation of Mitt Romney for the transportation of his dog Seamus in a crate on top of a car has made even me take notice. The first point is that those attacking Romney have so far produced no explanation as to why crating a dog on top of a car is unsafe. This is not a well known fact but one of the most dangerous places for a dog is travelling unrestrained inside the cabin of a car. During fast breaking the unrestrained dog becomes a moving projectile continuing to move through the car with the speed the car was previously travelling at. This put both the dog and the occupants of the car at great risk. I have treated many dogs that have sustained life threatening injuries in a minor car accident while travelling unrestrained inside the cabin. Travelling on top may be far safer for the dog as long as the crate is well anchored to the car. The other issue is the implied psychological damage to the dog. In my professional opinion these claims have no validity. Dogs feel safest in small enclosed spaces. Dogs are routinely crated for long haul aeroplane flights. Placing a dog away from the cabin may actually be a safer option as it reduces stimulation to the dog and is less detractive for the driver. To sum up, we all feel strongly about the welfare of our four legged friends but claims of cruelty need to be justified with evidence, not shrill emotion. Those leaping to attack Romney on this count should consider providing sound support for their claims. Otherwise those claims appear to be motivated by politics, not animal welfare. I don’t know much about what happened with the crating issue and Romney. 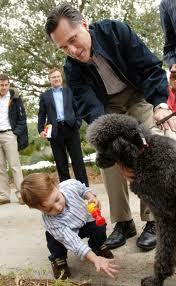 I’m not a supporter of Romney but I see why he might have crated the dog on top of the car. The issue is I don’t believe that is a very safe place. Although some may believe that they have harnessed the crate on top of the car safely to avoid any movement even at the hardest of braking scenarios, the fact of the matter is that the top of the car is a very difficult place to keep “stable”. The crate door could open under pressure etc. I have seen this done before here in Kuwait. I have mixed feelings about it. I prefer in the cabin of the vehicle with a harness protecting the dog from being flung around but even then I’m not too convinced. A crate in the trunk if you have an SUV is probably the best choice (granted your AC can reach back there during the summer time. I have even seen some people here buy a little dog trailer hitch cabin such as the ones you’d transfer horses. But it’s essentially a little transfer platform that connects to the back of the vehicle in which you can put a crate on. From there you can harness the crate in as you would on top of a car. This in my eyes is also a little dangerous (if there is a collision from behind, if not harnessed correctly, if the hitch is not connected correctly etc). At the end of the day, dogs and humans face the same issue in a vehicle. No matter where you are, you will remain unsafe as there is always a potential for danger. Personally I use the crate in the trunk method in my Jeep Grand Cherokee. I have noticed though that the dog gets car sick if in the crate. So if it’s a long ride, I use a harness that is basically a seatbelt for the dog. You connect it under the seat to anything that is stable and well built and then reach it around to the trunk or back seat. That way the dog is harnessed in, can move freely, avoids car sickness (due to crate) and is happy. Of course I drive real slow so the dog doesn’t fling around in the trunk like a rag doll on turns. You need to make sacrifices whenever you’re in a vehicle. Whether for the safety of your dogs, kids, or the people around us all. No law or method will prevail common logic and common sense. I personally believe there is a place on the market for a roof-top dog carrier that is securely bolted to the roof-rack and has an open-proof dog. Maybe I will design one. I will call it the ‘Romney Mover’.